The Exerpeutic 5000 Magnetic Elliptical Trainer is one of the elliptical machines that have made it to the list of the best elliptical trainers. It has great features that are designed to help users experience great and challenging workouts with 24 resistance levels. 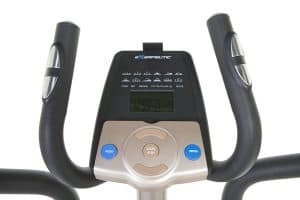 It also features Bluetooth Mobile App tracking capability which makes the machine to be unique and outstanding from the rest of the other elliptical machines in its category. When it comes to the aspect of durability and sturdiness it is fairly built with good user-friendliness. If you are not sure of the Exerpeutic 5000 Magnetic Elliptical Trainer, we can tell you it is a good elliptical. However, you may check out the verified Amazon customer reviews to see what the real users are saying and rating the machine, it is important. We tell our readers/audience to do so because that will further clear any reservations that they may have. The stride length is 18 inch which provides a comfortable full range workout without any stress on the knees and ankles. 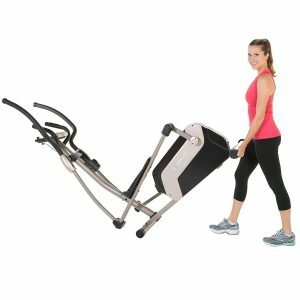 It features a 3-piece cranking system that ensures high performance and consistent workout and can support up to 270 pounds user weight capacity. 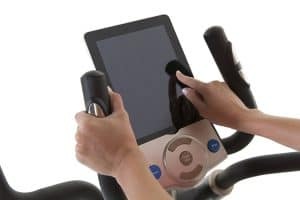 Plus other extras such as the smartphone and tablets holder that will make it possible for you to watch a movie read a book or magazine during workouts, and that is including the ability to even check emails while working out. Its dual action handlebars allow you to workout with versatility which means you can choose to work the upper (arms, shoulders and the back) and the lower body or just the lower depending on the handlebars you choose to exercise with. It possesses 24 levels of magnetic resistance that particularly provide you with challenging workouts that could really expedite weight loss. This is easily adjusted through the computer console. There are 12 workout programs available to choose from for a better workout experience plus 7 different training modes. The 18’’ stride length typically provides convenient, comfortable and full range strides that prevent any sort sourness or stress on the joints. The user maximum weight capacity is 270 pounds. The quality is great for its price but average in the sense of quality. It is also stable because of the extended leg stabilizers with non-slip feet. 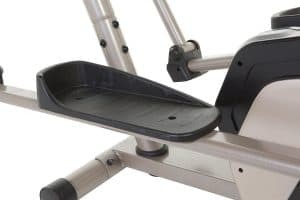 As aforementioned, it Bluetooth capability is one unique feature that makes the Exerpeutic 5000 Magnetic Elliptical Trainer stand out from the rest. A user will be able to track workout results anywhere and anytime with the mobile app tracking that uses the Bluetooth technology. It has got double transmission drive system that operates with a 2 flywheel and 2 belt design system. As a result, the overall gear ratio and the result are doubled with increased momentum and a soother striding motion. It has a 5’’ by 10’’ LCD display with 4 individual settings. A user will be able to view the workout data/metrics such as the time, distance, RPM, Watts, and heart rate. The dual handlebars simply allow a user to experience complete body workout. Its larger stride pedals design conveniently accommodates most users of different feet size and also prevent foot slippage when working out. Averagely good in terms of quality but great for its price range. The handle pulse sensors enable and allow the user to monitor the heart rate in order to maintain the target heart rate zone at all times. The machine is equipped with a tablet and smartphone holder which also includes an adjustable latch for securing mobile devices. There are transport wheels available that aid in the relocation of the machine. There are reports of good customer service from retailers such as Amazon. Users have applauded the way their issues were handled professionally and swiftness. Water bottle holder available for making water handy which is necessary for hydration during and after workouts. There are some users that have complained that the resistance is high even on level 1. Some have also complained of squeaky sound during a workout but not overly loud. What Do We Like About the Exerpeutic 5000 Magnetic Elliptical Trainer? Well, we love all the good features mentioned above. We love the fact that this machine at its price possesses some great features. The 24 levels of magnetic resistance provide the challenging workout experience to those that wish to burn a lot more calories and achieve weight loss. The Exerpeutic 5000 Magnetic Elliptical Trainer could be considered as a reliable machine that can meet the users’ expectations as to what they intend to achieve fitness wise. The dual transmission with 2 belts and 2 flywheels allow a user to pedal in both directions, whereas the resistance can easily be adjusted via the LCD computer display. There is no doubt that this machine was built with a quality considering its price, as we have repeatedly mentioned. The 3 piece cranking system is also an evidence of the quality aspect of the machine as well. The machine can support up to 270 pounds of maximum user weight capacity which we think is fair. Stability has never been the problem of this machine and users can work out as vigorous and intense as possible without having to worry about wobbling. If we do not mention the Bluetooth capability then we have not been entirely fair to the good aspect of this unit. This feature allows users to connect to the Exerpeutic Mobile App wirelessly with their mobile device in order to keep track of their workout results anytime, anywhere. While you have an LCD display that provides your workout data such as time, distance, calories burned, speed, and much more. Folks of 6 feet 1 inches have no problem using this machine because they found it convenient and comfortable. Moreover, it a medium size machine that is not too big which means it can fit in most rooms and the weight is neither too much because it weighs about 84 pounds with transport wheels to help in the relocation process. It generally has an ergonomic design that fits and provides comfort during a workout. Of course, we don’t like the fact that some users complain about how difficult the level 1 resistance is but then this is not a problem to the majority of the users. Moreover, the assembling takes time partly because it is an elliptical machine and partly because the parts are not labeled in order to help users to identify parts easily as they follow the detailed instruction manual, but again, this should not be a problem to most people. 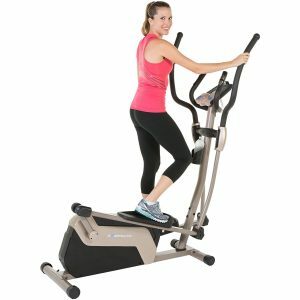 The Exerpeutic 5000 Elliptical Trainer’s shipping cost depends on the retailer you are buying from, however, retailers such as Amazon ships and delivers this unit without any shipping cost or charge. To assemble this machine is relatively easy but takes time. It comes with a detailed manual that can walk anyone through the process of assembling except for the fact that some people have a hard time identifying the parts easily. It does not really require any serious maintenance expect to always keep it clean from dirt and sweat. In our opinion, the Exerpeutic 5000 Magnetic Elliptical Trainer is recommendable for home use. It is built with the right features that could help any fitness enthusiast to achieve his/her fitness goals. The Bluetooth feature makes the unit stand out from the rest of the other elliptical machines in the same price range. It does also have a good ergonomic design that makes it difficult for users to complain about comfortability. Do leave us some comments below if you have any questions and we shall be really glad to get back to you.